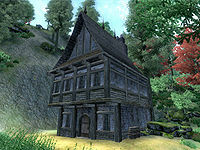 The Isolated House is an unmarked house between Skingrad and Bravil. It is a house located in the middle of the wilderness with no map marker of its own (it acquires one once an Oblivion Gate spawns inside it) and thus cannot be easily located. It truly is an Isolated House, but it seems to be not much else beyond that. The house is located just north of the "t" in "West" of "The West Weald" on your world map. It is backed up against the corner of a cliff face and as a result is hidden very well. Because it has no map marker, it will not show up on your compass. There is an overgrown dirt road leading to this house from the west, but it is difficult to find. If you install the Knights of the Nine plug-in, you are more likely to find this house, since it is located just east of the Priory of the Nine, a building added by the plug-in. The house is three stories with only one zone and is home to respawning bandits. The first floor has a table, a rack, and an unlit fireplace. The second floor has two beds, a dresser, and a cabinet. The third floor is really just an attic with some crates. It is a bad idea to use the house as a storage area. Not only do all of the containers respawn, but also if an Oblivion Gate appears at this location, everything in the house is destroyed. Outside of the house are two barrels against its left wall and a stump with an iron war axe near the rear wall. The house has an architecture similar to that of certain houses found in Skingrad. The house is often destroyed by an Oblivion Gate that spawns on top of it. This only happens if you approach the vicinity of the Isolated House some time after completing the Weynon Priory quest and before completing Light the Dragonfires. If an Oblivion Gate does spawn in the house, it provides a map marker for the otherwise-unmarked location. It is possible the Oblivion Gate will spawn as you exit the house.